The illustrator celebrates Roald Dahl's character with a set of drawings. Turning thirty is a big deal. 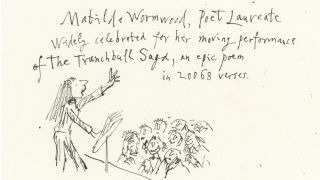 And while it's an anniversary that can fill a lot of people with existential dread, Roald Dahl's beloved bookworm Matilda Wormwood seems to be taking it in her stride in a series of new ink drawing illustrations by Sir Quentin Blake. Unveiled by BBC News, the new set of illustrations was created by Blake to celebrate 30 years since the publication of Matilda. But rather than depict another scene from the book, which he illustrated upon its publication, Blake has imagined what Matilda is getting up to three decades on. Unsurprisingly, she seems to be doing alright for herself. While plenty of people Matilda's age are scrimping for a deposit or juggling work and life struggles, the child who famously bested the beastly Miss Trunchbull has gone on to have a glittering career, or five. We wouldn't expect anything less from the Wormwood wunderkind. Her love of books has seen her become a celebrated poet laureate, with her epic poem The Trunchbull Saga fascinating audiences across 20,068 verses. In between penning poems, Matilda finds the time to be the CEO of the British Library, an astrophysicist, special FX artist and a world traveller and linguist. Check out the illustrations by clicking left to right in the gallery below with the arrow icons. Since its release in 1988, Matilda has gone on to become the best-selling Roald Dahl book, with 17 million copies flying off the shelves. The story was turned into a film in 1996, and a musical with music by Tim Minchin even more recently, and has been taken into the hearts of generations of readers and viewers who identified with the downtrodden Matilda. Along with some quotes from the woman herself, the illustrations will feature on the covers of anniversary editions of the book, released on October 4. As well as getting Blake to check in on Matilda, the book's anniversary saw the Roald Dahl Story Company ask the British public who she's still friends with. The top answer? Her childhood best friend, Lavender.